The control panel shows the speed digitally and indicates the amount of pressure applied onto print or board. 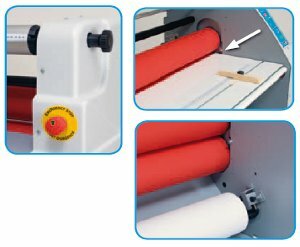 With this easy to use display and the quality of the material used in its construction, Baltic 1400 is certain to obtain a perfect fi nishing and protection result on posters and signs whoever the operator. Without handles or levers, the elevation of the roller is controlled electronically, preventing any mechanical damage or failure to the machine and reducing operator error. Baltic is an ideal choice for printers and sign-makers wanting to integrate a fi nishing unit into their workshop for a lower budget. 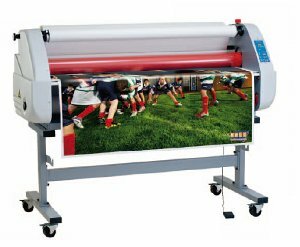 - Width 1400 mm (55”). Safety : Optical eye, Visible laser eye in front of the roller, stopping the motor when cut. Magnetic table detector. If the feeding tray is not in place, the driving motor won’t start. If one of these safety mechanisms is activated, it is requested to correct the fault and reactivate the system. 2 emergency stops easily reachable on the front and back of the machine. Self-blocking roll-shafts : With our new even lighter self-blocking roll-shafts, you will save time while changing fi lm. No tools are required. They can be used in any position of the machine in both directions. Storage of 2 fi lm rolls easy reachable under the laminator. Feeding tray : The graduated feeding tray is removable. 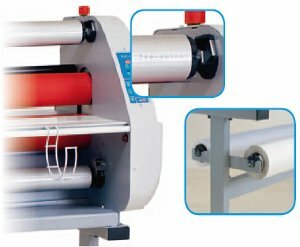 While loading the film or print reels, it can be stored on the machine base without being damaged. 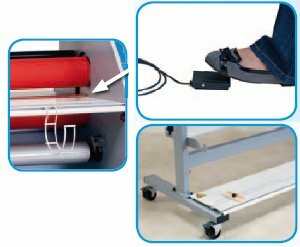 The footswitch control, once selected, allows the user to keep its hands free when feeding the prints through the machine, and is particularly useful when running wider posters.